October is a shoulder season in the northern and southern hemispheres, offering smaller crowds and lower prices than the summer or winter months. Escape the autumn chill for warmer weather or celebrate the season’s foliage at one of our top destinations for October. Lisbon offers a rich seafaring history, cosmopolitan ethos and a beautiful coastline. With temperatures hovering near the low 70’s, plentiful sunshine and smaller crowds than you’d find in the summer months, October is the perfect time to visit Portugal’s coastal capital. • Soak in the of the Torre de Belém, a beautiful 16th century structure featuring a monastery and excellent vistas. Located closer to Turkey than mainland Greece, the Dodecanese islands stay warm well into October, making this the perfect place to lay out in the sun and forget about summer being over back home. This Adriatic island is known for its beautiful beaches, medieval architecture and lively nightlife. 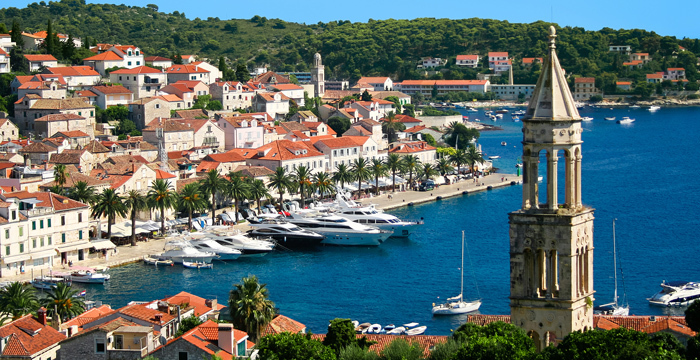 In the summer months, Hvar is packed to the brim with tourists from all over the world, but visiting in early October offers smaller crowds and a much more relaxed vibe. Its location in the southern hemisphere means that things are in full bloom down under in October. With the attractions of a big city and the laid back feel of a much smaller town, Melbourne represents everything Australia is about. Japan’s northern island offers up plenty of year-round scenic beauty, but in the fall its foliage and snow-capped mountains make it an especially majestic place to visit. As one of the oldest colonial settlements in North America, Quebec City is full of old-world charm. Combining great outdoor attractions with an urban feel, think of it as New England with a French twist. If you visit in October, you won’t have to head too far from town to see some of the prettiest fall foliage in North America. Between the start of the dry season and warmer temperatures south of the border, October is an ideal time to take a trip to Mexico’s capital. Its proximity means you won’t have to break the bank or spend a whole day traveling to get to a place that feels like a whole new world. This Dutch Island territory is safe from the Caribbean’s typically stormy season due to its’ southern location just 40 miles off the Venezuelan coast. If you’ve been dreaming of laying out on a white sand beach in October, Curaçao might just be your best bet. The summer months can be sweltering in Marrakech, but things really start to cool down in October, making it the perfect time to see what North Africa’s has to offer. Located on the African side of the Mediterranean coast, Tunisia’s capital and largest city is rich with historical sites and artifacts from the days of Carthage and ancient Rome, all set against a beautiful coastal backdrop. While the weather isn’t quite as dry in October as in the summer months, the warm temperatures and seaside setting mean you’ll enjoy a balmy, breezy trip.